I'm sure you have noticed some weird stuff about how airs rock is shaped if you have ever played through that area. on one side there's ledges that stick out of it as you climb up. However we normally think how it looks is based off of the over world sprite, which is in reference to the real life air's rock. However my evidence isn't too solid. 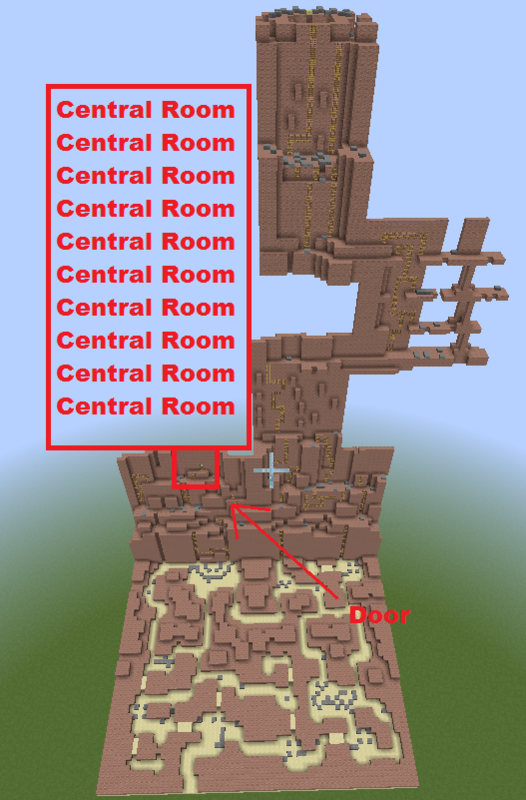 its mainly based on the fact that i always thought the big room in airs rock was located in the center of it. This is a picture from my Rebuild golden sun in minecraft of the entire out side of Air's rock stitched together. While i haven't built the inside due to some issues, I marked the area where the center room would be. if that room is the center, then airs rock would look vastly different then we all think. What do you think? Am i just looking to hard at it? I'm merely interested since i suggested the idea of one day making the entire airs rock in minecraft and that includes that which we can't see, so i kinda gotta know the shape. It's possible that there's just a lot of empty space in air's rock. The ancients didn't *have* to remodel the entire interior, after all. What's more, we never see the leftmost side of it, so it could potentially stretch pretty far. That said, all four rocks are just recolors of each other, so we can't know for sure, but I would suspect that the rocks (including unseen space) should be *roughly* the shape of the overworld sprites. Maybe a bit fatter or thinner, but probably the same general shape.